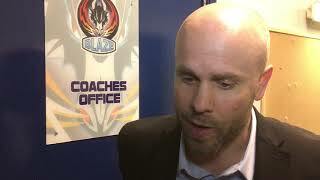 The Genting Casino Coventry Blaze suffered a 5-4 overtime defeat to Guildford Flames at the Spectrum but collected a crucial point in the Elite League playoff race. With Canadian defenceman Justin Hache back in the line-up, Coventry went ahead early through Luke Ferrara at 1.58. Richard Krogh, scoring his first Elite League goal tied things at one on 9.44 before Erik Lindhagen gave the home side a 2-1 lead (13.28) going into the first period break. Just 1.10 into the second, Swede Thom Flodqvist tied the game again 2-2 before Blaze went ahead through the in-form Shawn Pauly at 31.22. Each side were to score again before the second interval, with Jamie Crooks (36.21) making it 3-3, and Dillon Lawrence (37.04) registering to give Blaze a 3-4 lead after 40 minutes. With John Dunbar scoring the only goal in the third period (45.16), regulation time ended 4-4 and with both teams taking a point, the game went to sudden death overtime. After Nicolai Bryhnisveen was handed a cross-checking penalty, through Jesse Craige, the Flames scored the game-winner on the 4-on-3 powerplay (62.10). 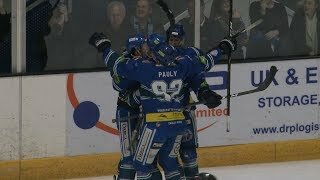 The result means Blaze sit one point ahead of Manchester Storm just inside the playoff places with three and two games remaining respectively. The two go head to head in what could be the decider on Saturday in Manchester.